Enjoy ”Livin’ on Tulsa Time” at the River Spirit Casino Resort in Tulsa, Oklahoma, and the adjacent Margaritaville Casino at River Spirit. 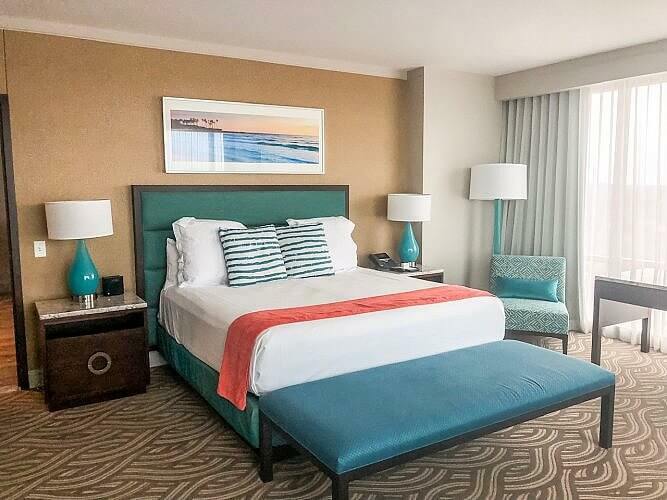 This two-fer combination features a hotel, five restaurants, two bars, pool area with bar and dining, two casinos, spa, convention and meeting space, and the 2,500-seat Paradise Cove for live entertainment and sporting events. 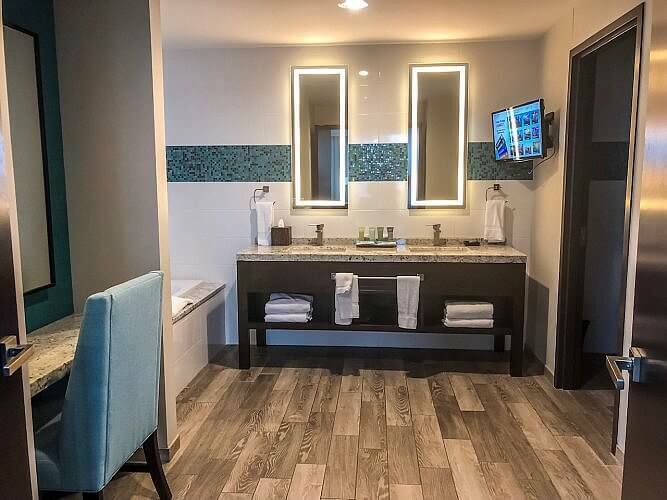 Owned and managed by the Muscogee (Creek) Nation, with proceeds helping to fund a variety of tribal services, the hotel at River Spirit Casino Resort is a 27-floor tower 483 rooms. 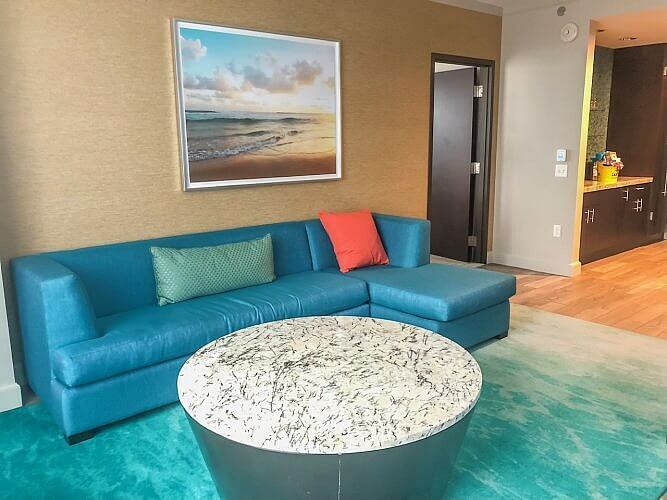 I stayed in a Signature Suite on the 24th floor and with over 1,000 square feet to roam around in, it was larger than any apartment I ever lived in. The decor is tropical, in turquoise, teal, and pops of orange, and it was easy to settle in and feel at home. The living room area had a view of the tropical-themed pool area, a refreshment area with refrigerator, coffeemaker and coffee (complimentary), utensils, and water (also complimentary). A high top dining table was great to work at, although there was a full desk in the bedroom, and the sectional couch and chairs provided a comfy conversation area. I’m not a big television viewer, but there were large flat screens in both the living and bedroom and a smaller one in the bathroom. From the bedroom, I had a view of the Arkansas River, providing a nice view while working at the desk, lying in bed, or enjoying the soaking tub in the dressing area. The king-sized bed was comfortable, with a blanket provided in the closet in case I felt chilly, and there was easy access to plug-ins and USB ports. I think the bathroom and dressing area were the real stars of the suite. The dressing room had a soaking tub with a window view of the Arkansas River located in such a way as to prevent anyone seeing in and thoughtfully provided bath salts. The vanity had double seats with good lighting and there was a separate makeup area with a seat and lighted mirror as well. The toilet and walk-in shower is in a separate room, the latter being large enough for two people. I ate at three of the onsite restaurants, Ruth’s Chris (a national steakhouse chain) for fining dining, Margaritaville (a tropical-themed chain owned by Jimmy Buffett) for casual dining, and Johnny Rocket’s (another national chain) for a burger and fries. Visions Buffet and Fireside provide local dining options, with Fireside providing room service dining. I ordered room service breakfast one morning and although there was supposed to be on-screen ordering, it was not working during my stay. Operators were standing by to quickly take my order with delivery within half an hour. Since fall has well and truly arrived, the pool area was closed. 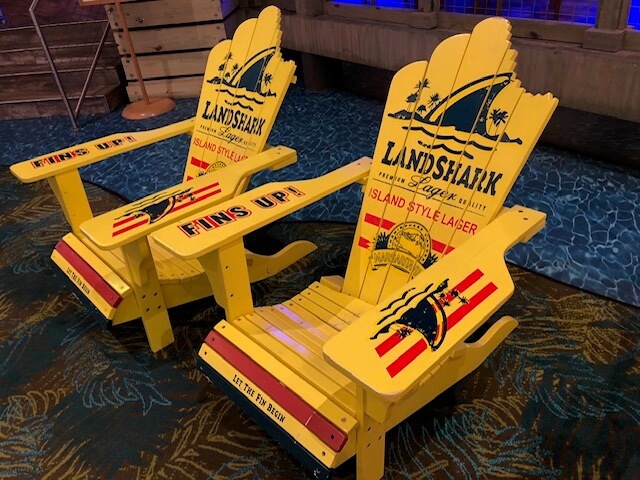 During the season it features a Landshark swim up pool bar, along with beverage and food service from Margaritaville’s Tiki Bar & Grill. Lounge chairs surround the pool along with a few cabanas available for rent. Cabanas have a television, fan, and water, providing a needed escape from the intense midwestern sun. The pool is free for hotel guests, wristband required, although non-hotel guests can purchase day passes based on occupancy. I’m told that on weekend it’s very crowded as locals make this a hot spot for a date or to meet people. Plan accordingly. 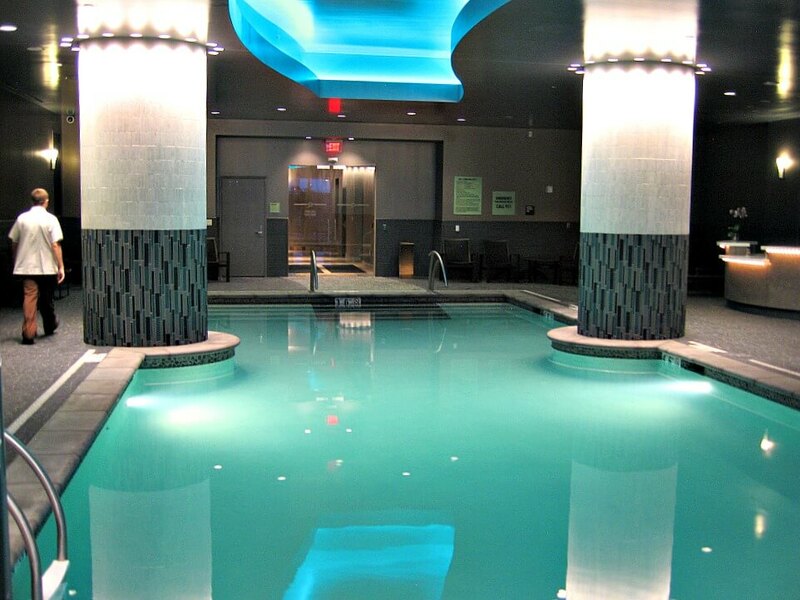 Since the pool wasn’t available for a little rest and relaxation, I headed for Emerge Spa for a massage. The spa offers dressing rooms with lockers, personal showers, along with sinks and mirrors. 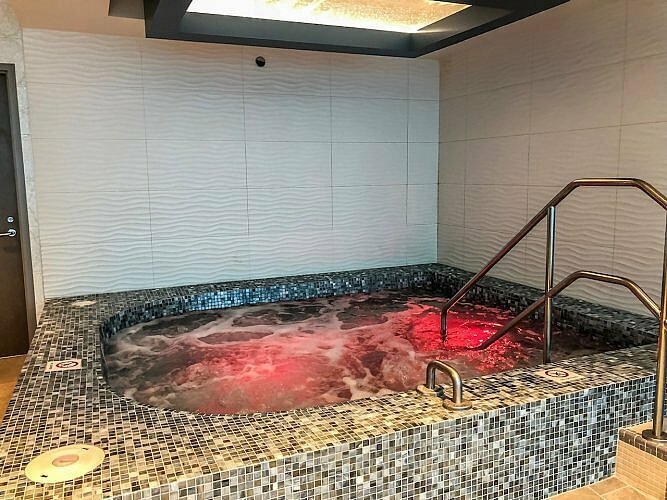 In addition to the treatment rooms, the spa offers a dry sauna, steam room, whirlpool in the women’s locker room, and a sauna and steam room in the men’s. A co-ed hydration room is also available. I was disappointed in the paltry provisioning of products in the women’s dressing room. I’ve come to expect a full supply of grooming and beauty products in an upscale spa. Use of the spa is included with all treatments, so if possible, plan to allow in a little time on both ends of your treatment to ease into and out of the experience. Day passes are also available if you’re not having a treatment. 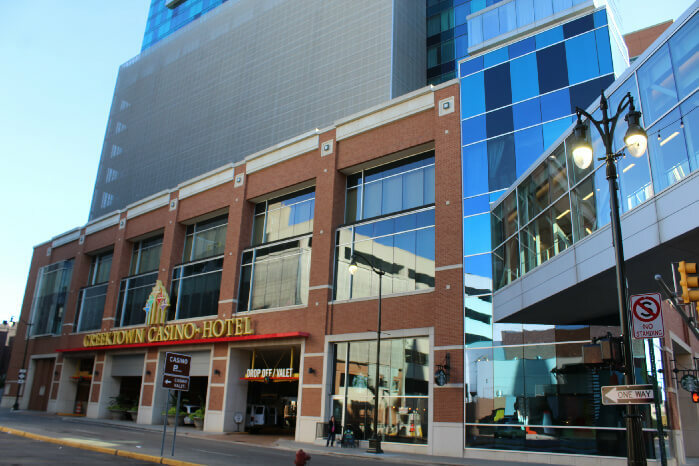 When you’re ready to try your luck at the tables or slots, River Spirit Casino Resort offers two casinos to choose from. The two casinos are joined by a short hallway, making it easy to go back and forth as your aesthetic – or gambling luck – prefers. The River Spirit Casino is what I’d describe as “old Las Vegas” and is dark and traditional in its theme, while the Margaritaville side is bright and tropical in its theme. Your favorite side will likely be the one you’re winning on. Adjacent to the hotel, and still on the resort property, is Paradise Cove, a 2500-seat state-of-the-art entertainment venue. River Spirit Resort Casino offers a diverse line up of entertainment, from rap to comedy to country and more. Staying at the hotel post-concert is an easy way to have a fun getaway weekend. The River Spirit Casino Resort and Margaritaville are located at 8330 Riverside Pkwy, Tulsa, Oklahoma, about a half hour drive from the Tulsa International Airport. Rates start around $89/night. Disclosure: The author was a hosted guest for a stay at River Spirit Resort Casino and Margaritaville.